Deposit: $25.00 to reserve the room. Payment Method: Personal Check, Traveler’s Check, and/or Money Order. 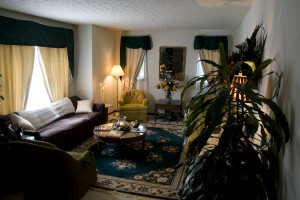 Room is furnished in antiques from the iron twin bed to the oval braided rug. Features a comfy king size bed and the decor includes a loveseat sofa. This relaxing room has a king bed and is accented with a bistro table & chairs. Contact Us for possible available dates and any questions you may have.